Joey offers his summary of the University of Waterloo VeloCity Fall 2008 Project Exhibition. Velocity is a student residence, it is a dorm for 70 University of Waterloo students that encourages students to form teams and build projects to be showcased at the end of term Project Exhibition. This was the first group of students in the dorm and there were 16 student projects created. Each team of students provided a 3 minute pitch to the audience in the lobby of the Davis Centre. 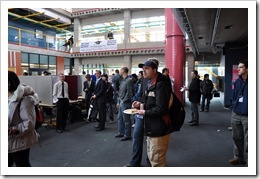 Amar Varma from Extreme Ventures had a Cdn$1000 prize for the “project team deemed worthy”. Sparknav was the winner of the $1000 from Extreme Ventures. Grocerus – A location-aware web app that matches grocery lists against hand entered grocery store data. Built in PHP. Gruup – A group buying service. Built on Pligg in PHP. Sparknav – A mobile navigation application for use in enclosed (non-GPS) spaces. Prototype build for Android. Emoshion – A mobile application for location-based fashion news. Find It Off Campus – A web application for helping UW students use geography and location to find housing. Built in Rails. Szello Mobile – A mobile consultancy focusing on mobile user experience and UI design. Fading Hearts/Magical Aces – An anime styled choose your own adventure. Ufansi – A web application that helps connect donors with charities. Built on Drupal in PHP. Giftah – A web application that creates a marketplace for gift card exchange. ClassAlbum – A web application for managing classroom schedules and finding vacant rooms. Comic Battle – A multiplayer online fighting game built in Flash. My Story – A publish platform for authors. CashIn – A wallet with an electronic financial advisor that tracks your spending and provides warnings based on personal budgeting. inPulse – “Send email to my watch”. A Bluetooth watch that connects to your mobile device to display email, SMS, caller ID on your watch. Threadband – A causal game for the iPhone. Metacast – A YouTube or Blip.TV competitor. Allows users to create channels of existing RSS feeds. Built in PHP. The projects ranged from a series of ideas expressed on posters; to functioning software. As Rick Segal and Austin Hill conveyed at StartupEmpire, it is great to see entrepreneurs get up in front of an audience and give their pitch. One of the main reasons that entrepreneurs in other locations (particularly Silicon Valley) are better at giving pitches is the number of times they give the pitch and the amount of feedback they receive. Generally, the projects and the presentations were uninspiring. This is not to say that the entrepreneurs should be discouraged. But that I was underwhelmed by both the content and the presentation style. It leads me to one of the key takeaways from StartupEmpire. It is that we need to build a better formalized mentoring network for young entrepreneurs. When I look at programs like Techstars in Boulder, CO they are built on the notion of mentorship. Just look at their Mentors (there are 59 listed on the dang page): Brad Feld, David Cohen, Howard Lindzon, Jeff Clavier, Stewart Alsop. The mentors are from all over the US and cover a wide range of expertises in different industries and functions. If an entrepreneur can’t find a mentor that can listen to their situation and coach them on how they could perform, then the entrepreneurs shouldn’t be in the TechStars program. To this end, Jesse Rogers called me out on providing mentorship to the VeloCity students. I will be following up with Sean Van Koughnett to offer my time to mentor any of the teams or students. My first piece of advice for any of the VeloCity student is be realistic about what you are building. So many entrepreneurs appear to take the “Field of Dreams” approach to project selection. There is nothing wrong with this approach, however, just because you’ve built software that solves your problem doesn’t mean that there are customers, a potential market or any reason to raise funding. A programming exercise does not by default equal a multi-million dollar company. There are a great number of projects and tools that were developed as to solve problems for a developer (look at rake, ant and Capistrano) that are not businesses. They enable developers to be more productive but are not great businesses. Some of the projects like Sparknav, Emoshion, Find It Off Campus showed the first steps to becoming real businesses. They demonstrated the ability of the team to deliver functioning, stable code. They demonstrated a need in the community – Find It Off Campus already has 108 rental properties after less than 2 weeks of being live. And Emoshion, while too narrowly focused as pitched by the founders to be a great business, it demonstrates a potential white-labelable mobile social networking application that I’ve seen requested by ad agencies and marketers. These startups could benefit from time with experienced technologists, business development persons, investors, and marketers about how and when to monetize and grow their offering. It was great to see 16 short presentations from the residents of VeloCity. It will be interesting to see if the quality of the projects and outcomes increases at the end of the Winter 2009 term. Hey David, it's James from Metacast, thanks for the write up! Hey David, it’s James from Metacast, thanks for the write up! I don't know if a TechStars-like program could work in Canada, but I certainly think we should keep looking at those possibilities and work towards those types of initiatives. I don’t know if a TechStars-like program could work in Canada, but I certainly think we should keep looking at those possibilities and work towards those types of initiatives. Thanks for the write-up and the kind words on our project, Sparknav! After a few weeks into the initial development for our mobile application, our team and I sat down and talked about the 'softer' side of our project. We realized that instead of coding frantically, it would be better to concentrate our efforts, understand our target market and develop key features that people want. This helped us a lot in terms of producing something usable in the short period of less than 3 months. For current (or aspiring) Velocity residents, I'd advise all of you to conduct market research and find a need before any brainstorming or development. It'll save you loads of time when you do the above, as you'll come to realize that a product should do a few things very well, instead of something that does everything poorly (given that your product solves a need in the market). After a few weeks into the initial development for our mobile application, our team and I sat down and talked about the ‘softer’ side of our project. We realized that instead of coding frantically, it would be better to concentrate our efforts, understand our target market and develop key features that people want. This helped us a lot in terms of producing something usable in the short period of less than 3 months. For current (or aspiring) Velocity residents, I’d advise all of you to conduct market research and find a need before any brainstorming or development. It’ll save you loads of time when you do the above, as you’ll come to realize that a product should do a few things very well, instead of something that does everything poorly (given that your product solves a need in the market). this a nice opportunity of test..
Jeg ved ikke, om en TechStars-lignende program kan fungere i Canada, men jeg tror, vi skal holde os se på de muligheder og arbejde hen imod de typer af initiativer. I like the idea of metacast as I do watch videos on a variety of feeds, I think it would be a really useful tool. There is need for a well-developed mentoring program in Toronto/Canada. After watching David Cohen’s presentation at Startup Empire, that was clear. How about a MentorCamp to get things rolling? There is need for a well-developed mentoring program in Toronto/Canada. After watching David Cohen's presentation at Startup Empire, that was clear. How about a MentorCamp to get things rolling? Great way to build teamwork and ideas!